To assess the performance of the NV1050 in removing aerosolised Mycobacterium smegmatis, a surrogate for Mycobacterium tuberculosis. The impact of Novaerus (NV1050) air purifier on aerosolised M. smegmatis was conducted in a 30 m3 environmental testing chamber. The test chamber was preconditioned to 20 ± 3 °C and 55 ± 5% relative humidity. These conditions were maintained throughout the test and control runs. Prior to each run, the test chamber was decontaminated by scrubbing the walls and surfaces. 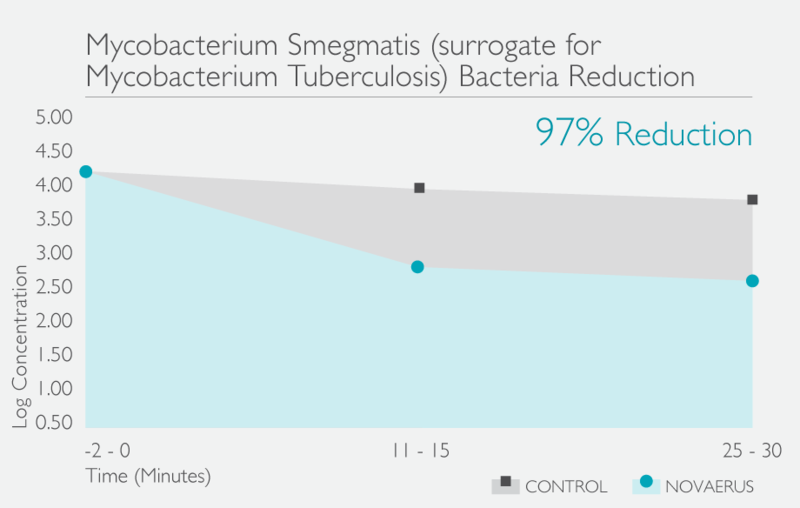 The results achieved during the testing show that the NV1050 was able to reduce the concentration of M. smegmatis artificially aerosolised by 95% within the first 15 minutes and this rose to 97% after 30 minutes of A/C operation.